Looking for a LED G9 lamp? LED G9 lamp at the best price! 2 years guarantee! Are you looking for a LED G9 lamp? At My Planet LED, you are at the right place! 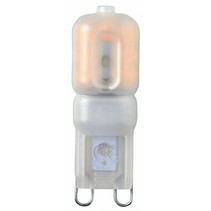 We have LED G9 lamp in different wattages and heights. At My Planet LED, you will find the right LED G9 lamp! A LED G9 lamp is the perfect replacement for the halogen G9 lamps. The LED G9 lamp is connected immediately on 220V. Beware at the height! The LED G9 lamp is mostly bigger and higher than the halogen version. You can buy your LED G9 lamp at My Planet LED and there are more reasons why you should order your LED G9 lamp with us. With us, you order easyly and quickly your LED G9 lamp. If you are not sure that the LED G9 lamp is the right for you : no problem because at My Planet LED, you can use our 14 days return policy. Of course, you can also count on the excellent service of My Planet LED! Would you like to have more information about a LED G9 lamp? Do you need more information about one particular LED G9 lamp? Or are you looking for a special LED G9 lamp which you cannot find on our led shop? Or would you like to have more information about My Planet LED? Contact us please! You can send a mail at info@myplanetled.com or call us at (+32) 57 466 866.